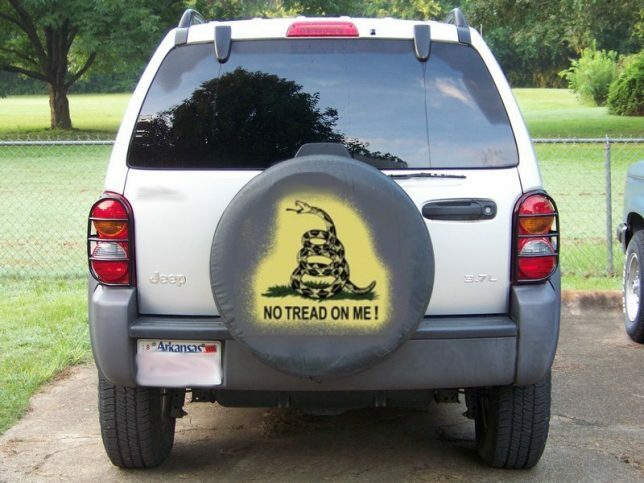 Patriotic themes are commonly seen on spare tire covers – even more than cats – and slogans dating back to the Revolutionary War are especially popular. Now you may or may not recall that in 1774 celebrated man of letters Samuel Johnson famously stated “Patriotism is the last refuge of the scoundrel” but hey, he was British and as such, played for the other team. 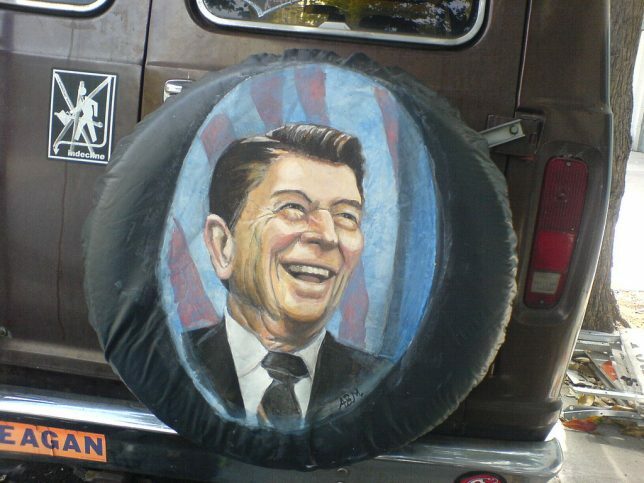 Still, some of Johnson’s sentiment still rings true today as illustrated by the above spare tire cover. 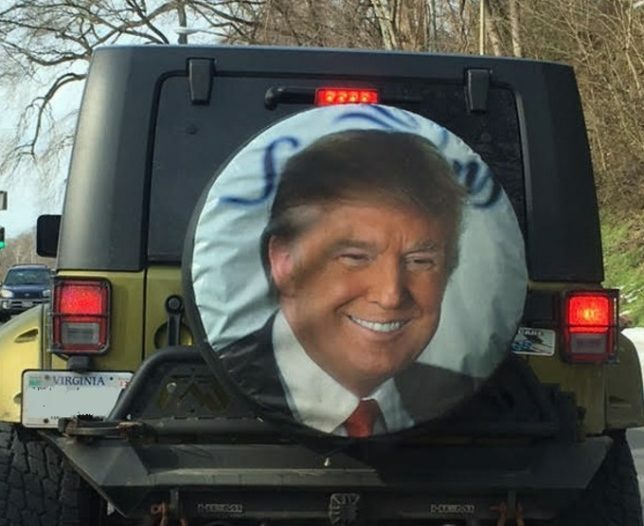 What can we say about the “wheel Donald Trump” spare tire cover spied in Georgetown, VA last year other than to state it’s unusually large, one might even say “bigly”, believe us! It appears the cover was adapted from a Schwan’s spare tire cover – that’s their logo peeking out from under #45’s characteristic combover. You don’t think the Trump Campaign and Schwan’s er, colluded on this cover-up, do you? 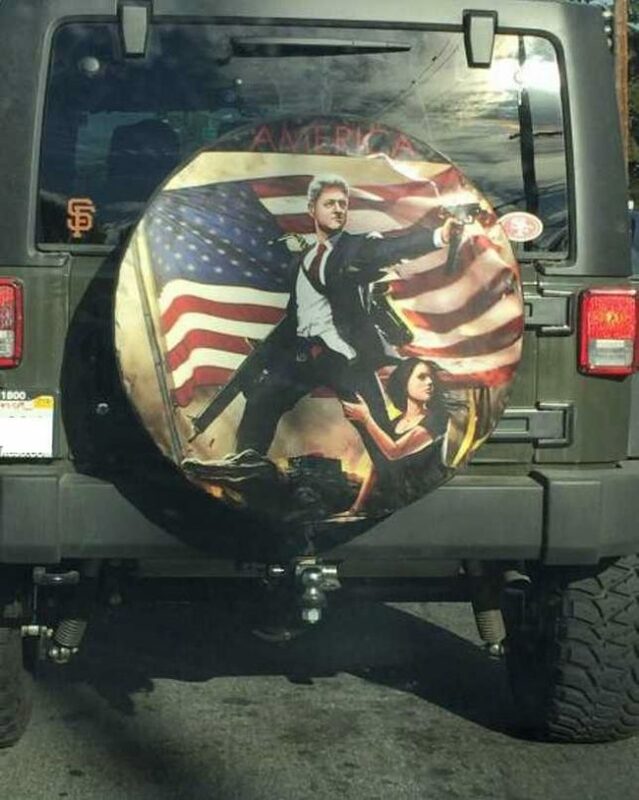 Sorry Ron and Don, Bill Clinton’s spare tire cover may be the greatest spare tire cover of all time, at least when it comes to over-the-top patriotic sentiment. Give the anonymous artist credit for cramming the Old Glory, our well-armed hero, Monica Lewinsky and… an alligator? – onto a single circular tire cover. And no, that’s NOT Hillary’s Jeep. She’s not a Giants fan. 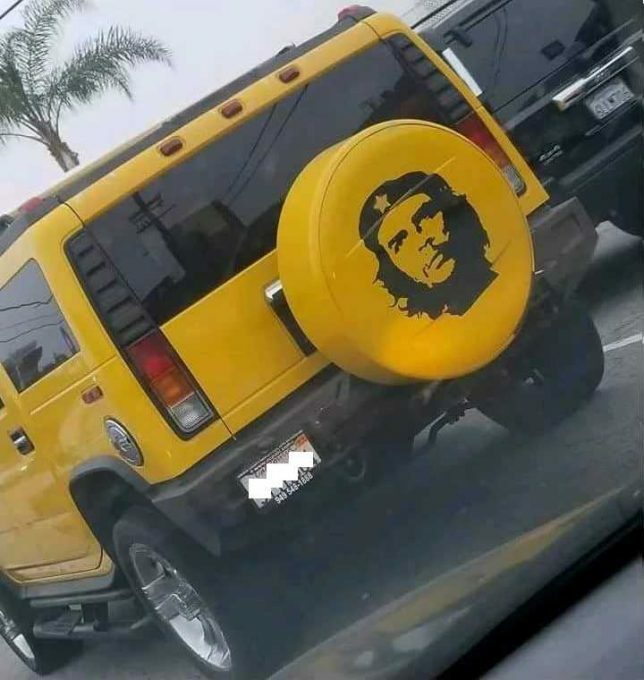 The iconic visage of communist revolutionary Che Guevara has certainly racked up a lot of mileage… and this Hummer driver‘s doing his bit. 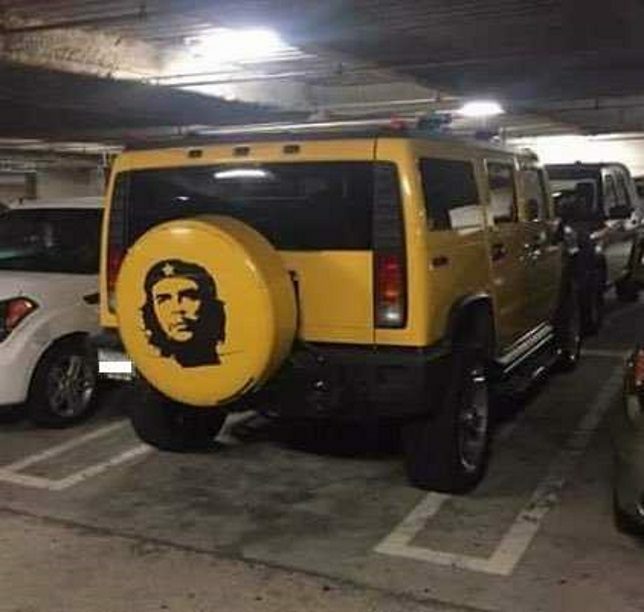 Can’t say the poster-child for Marxist ideology would be pleased to see his face plastered on the back of a Humvee, however. Walkabout blogger Al Denelsbeck does holiday gift-giving in style. 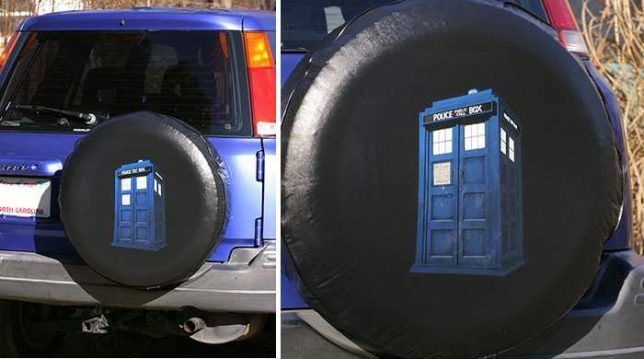 Knowing his GF’s daughter was a major Dr Who fan, Denelsbeck painted a stunningly accurate Tardis on the spare tire cover of the girl’s new (and very blue) Honda CR-V. 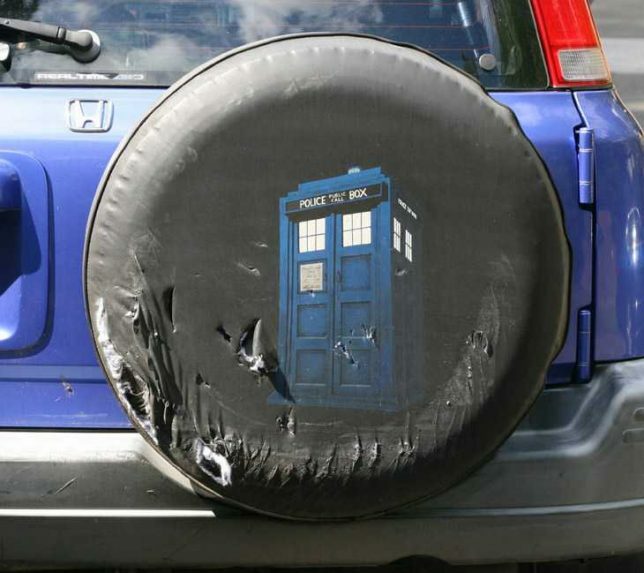 Does that mean the tire’s much bigger on the inside? 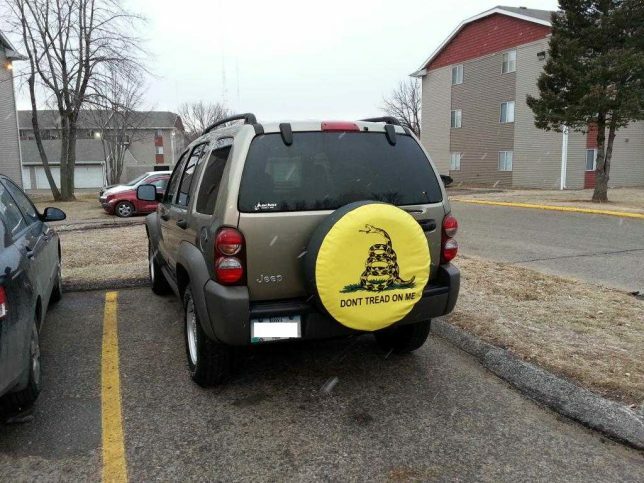 Fast-forward two years and the inevitable occurred… you’ll recall our mentioning spare tire covers were designed to last? Unique paintings, on the other hand, are subject to Murphy’s Law and rarely get off scot-free. Is there a doctor, er, an artist in the house?